I’m a big fan of flapjacks – they’re sweet and oaty and fruity and yummy. Even better, they’re gluten-free, so my coeliac friends can eat them too. Most of the time I make mine with cherries and sultanas, but it’s just as easy to substitute in other ingredients. Takes 10 minutes to prepare, 20 minutes to cook. Whilst the meltening is happening, chop up your cherries. I tend to take them down to quarters. Once everything’s melted remove from the heat, and mix in the oats, cherries and sultanas. Press into a tin, and cook for 20 minutes in the oven. 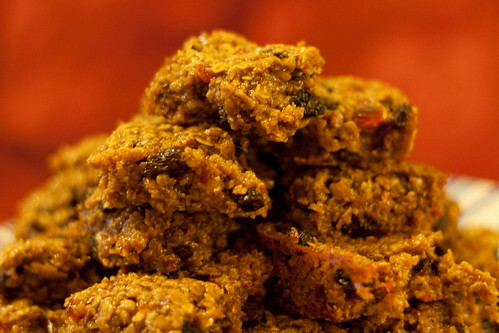 Once it’s out of the oven, let the flapjack cool for a few minutes before scoring it deeply into portion sized pieces. Once cold, turn out the flapjack and break into pieces. Sorry Lisa, that was just my attempt at humour. “Meltening” would just be melting. Sophia – I tend to cut this into about 50 small pieces. If you added two or three together you’d get a portion that I’d expect to buy in a coffee shop.